Escot Entrance / Field Gate - Blamphayne Sawmills Ltd.
A high specification gate made from kiln dried Scandinavian Redwood. 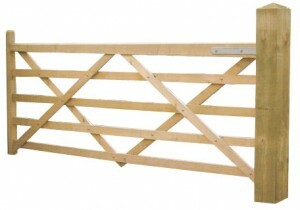 This gate has a top quality planed all over finish. The hanging style is ex125mm x 75mm with an ex75mm x 75mm closing stile and an ex100mm x 75mm top rail. Gates with widths up to 15’ wide are possible.